US Under Secretary of State for Political Affairs, David Hale, who is on a visit to Morocco, has commended King Mohammed VI’s call for an open and frank dialogue with Algeria as a move that will benefit the peoples of the region and their future. The US official who made the remarks during talks at the Moroccan Parliament in Rabat, has thus echoed the stand expressed officially by Washington regarding the royal initiative. The King’s call to neighboring Algeria is an offer to address the challenges facing the two countries and the entire Maghreb region, the State Department said early November. Improving relations between Algeria and Morocco would enable both countries to address common bilateral and regional issues, the State Department said, recalling that the US government has urged Algeria and Morocco to realize that improved relations between the two countries would help them to address common bilateral and regional issues such as terrorism, illegal immigration, drug trafficking and economic integration. 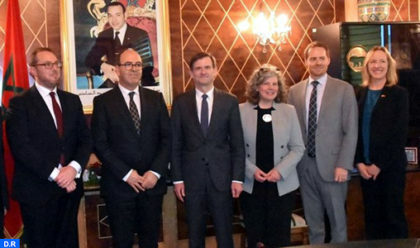 The Under-Secretary of State for Political Affairs, David Hale, also said that Washington supports the efforts of the UN Secretary General’s personnel envoy for the Sahara seeking to reach a solution to the regional dispute. Dealing with bilateral relations, Mr. hale underlined the particular interest the USA grants to Morocco given the Kingdom’s role in the region and the multi-faceted cooperation existing between Morocco and the United States in the political, commercial and security fields. The two countries are working together to fight terrorism and consolidate stability on the African continent, he said.